Telephones is back! This time with true norwegian underground vibe-archaeology, rescued from a humid attic on the rural island of Sotra, outside Bergen, Norway. Long presumed lost, the material featured on the first release on his own label, was originally conceived and programmed by a juvenile Mr Telephones on ancient PC-software at turn of the 90s/Y2K – at a time when the local Bergen-scene was percolating with main dogs Torske and Erot, a time when norwegian DJs were still allowed to play Peacefrog-records on national FM radio, and house, techno and disco was all-in-one. 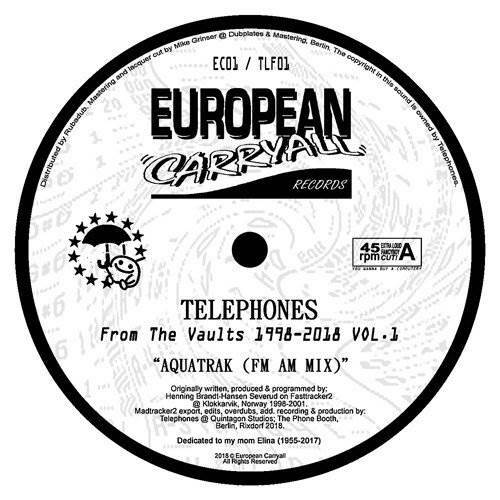 20 years later, the tracks have been salvaged, exported and meticulously overdubbed, re-recorded and edited to current high standards of Telephonic Communication. One for the true heads! More items from " European Carryall "
More items from " Telephones "